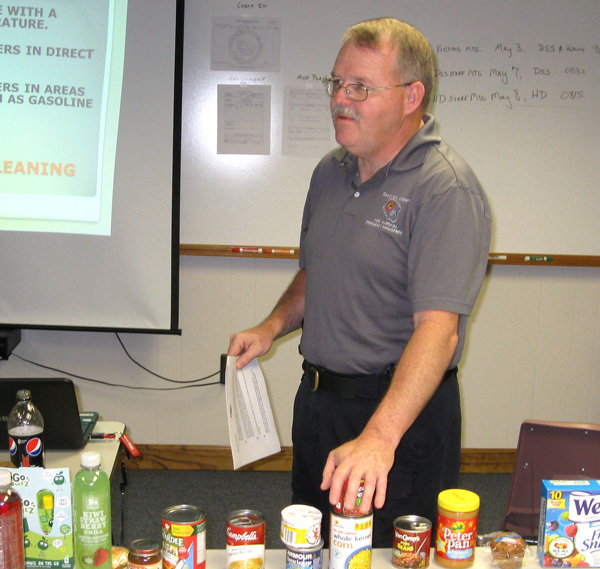 Kenneth Teague led a class on Tuesday night about emergency food and water supplies. Recent tornadoes and floods around the country emphasized the importance to be prepared for power outages and need for emergency supplies. He talked about the need for shelf -stable food that does not require refrigeration and may be eaten without cooking if necessary. Kenneth taught the class about various safe methods to store water. Our next meeting will include emergency food preparation and taste testing. Kenneth Teague, Emergency Management for Caldwell County Emergency Services, was honored recently as the North Carolina CERT Ccoordinator of the year at their annual conference. We are proud to have Kenneth leading our CERT program for Caldwell County. Congratulations, Kenneth! On Tuesday, May28, 6:00pm, there will be a class for CERT members about “Food Preparing.” The class will be held at the Lenoir EM training room, 616 West Ave. Let Kenneth Teague know if you will be attending. I hope to see your there! Caldwell County CERT members who wish to attend this exercise should notify Kenneth Teague. We hope to have a good delegation from Caldwell County participating. Community Emergency Response Team (CERT) full-scale exercise. Registration is now open through August 31, 2013! CERTEX 2013 will be the first exercise of this kind for North Carolina. Never has the opportunity arisen to bring the active CERT programs across the state to train in a multi-jurisdictional exercise. In partnering with the Civil Air Patrol, the American Red Cross, and the Baptist Men, and county and state emergency management, this event will promise more reality and diverse conditions than normally presented. This is an exciting venture that will truly test the stamina of participating CERT volunteers. To be held in September at Camp Butner, courtesy of the North Carolina National Guard and the NC Civil Air Patrol, volunteers have the opportunity to test their own response capabilities as learned through the Basic CERT Course and any ongoing training. They will also be able to learn how to interoperate with other response agencies such as peer volunteers and other agency personnel. The hope is that each team goes back to their community understanding how, in a large-scale disaster, to use their learned skills effectively and efficiently, within the scope of a larger operation. Lodging accommodations for this exercise are the on-site Quonset huts (see attached document for description). If you elect to stay elsewhere, you will be responsible for the costs associated with that overnight stay. There is no reimbursement for lodging. All scheduled meals will be provided for you on site. Any meals that you eat on your way to and from the exercise are your responsibility. There will be no reimbursement for meals or mileage for this event. On-site lodging and meals will be provided for all exercise participants. 1. Every participant is required to print and sign the attached “Waiver of Liability” form. You must bring it with you to the exercise in order to participate. You must be 18 or older in order to participate in this exercise. 2. You MUST be associated with an established CERT program to participate. 3. Create a profile in TERMS (terms.ncem.org), if not already done. 4. Directions to the exercise site can be found at http://goo.gl/maps/ujyf7. 5. Each participant is responsible for providing their own personal protective equipment (PPE).